Compared with a living tree, more species of life benefit directly from the habitat and nourishment offered by trees in the afterlife. While a tree’s death causes wildlife dependent on its pollen, fruits or nuts to go elsewhere, the death enables crowds of other woodland life to move in and vastly increase the diversity of species it supports. The moment a tree dies, creatures ranging from birds to bacteria move in to dissolve, chew and disassemble the cellulose and lignin structure into food or habitat. A habitat has four essential components that make it suitable for a particular population of animals: food, water, shelter, and space. A wildlife tree provides three of the four of those essentials making it an important part of your backyard habitat to increase biodiversity. 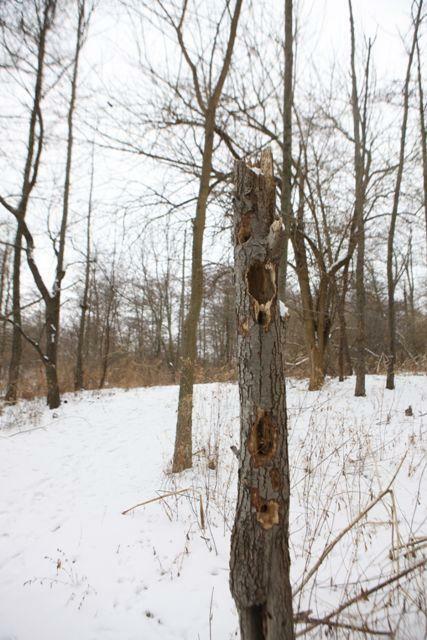 Some 85 species of birds in North America nest in the dying and dead trees that we call snags or wildlife trees. Dead and dying trees are in limited supply, making them exclusive stopover sites for exhausted migrating birds, and for the bluebirds, American kestrels, wrens, nuthatches, woodpeckers, and chickadees. Cavities located over or near water are used by tree swallows, prothonotary warblers, wood ducks, goldeneyes, mergansers and buffleheads. Some species, like chickadees select a cavity with the smallest opening they can squeeze through. This prevents nest predators (blue jays, raccoons) and nest parasites (brown-headed cowbirds) from entering. Great crested flycatchers often hang a snake skin in the cavity entrance, to scare off intruders. Primary cavity users excavate cavities in the decaying wood, while secondary cavity users wait for a woodpecker to do the work before occupying and enlarging the cavity. A dead tree also offers a place to build nests and a perch for hunting and observation (hawks, owls), safety from predators, and protection from the elements. Seeds, nuts and other food items stored in a cavity can determine which individuals make it through a particularly harsh winter, notes The Cavity Conservation Initiative. [i] The native bee larva and Lepidoptera (butterfly/moth) eggs that overwinter in tree bark also serve as food for birds and their spring nestlings. Mammals also use cavities in dead trees. Bats use natural and abandoned woodpecker cavities. Small mammals den in hollow trees. Flying squirrels prefer downy woodpecker cavities, which they line with shredded bark, or lichens, moss, feathers or leaves. Black bears sleep in the vast hollow trunks of huge sycamore trees that once sheltered entire pioneer families. The wildlife associated with snags play an important role in the dispersal of invertebrates. Peeling bark provides habitat for insects that wild birds consume. Protein-packed mushrooms -the fruiting bodies of fungi—attract more insects and hungry wildlife to the side of dead trees. When downed, hollow logs and dead trees are corridors used by predators as silent passageways through the noisy leaf litter. Below ground, a dead tree’s nutritional offerings eventually enters the soil, where they are further broken down and transported to different soil layers by the various decomposers. Decomposers including earthworms, firefly larva, ant colonies, snails, and crickets help return nutrients from the decaying debris to the soil, ultimately strengthening the forest’s ability to support life. Species that aerate, dig and fragment wood contribute to improved soil structure and quality. Decomposing wood, especially when accompanied by dead leaf litter, is a nutritionally rich and superior nursery for many seeds, such as shade-seeking wildflowers. Wood decomposers include bacteria, nematodes as well as types of fungi, called mycorrhiza. In return for delivering minerals (phosphorus, inorganic nitrogen) to the plant via its rootlets, the fungi receive moisture and carbohydrates from the plant, and sometimes a bonus in the form of special resistance to certain diseases. A piece by the Royal Society for the Protection of Birds (RSPB) from the UK urges “Bring your garden to life with dead wood”. Eventually, the structure of the dead tree dissolves and it falls over, becoming a “nurse log” because it provides a habitat for many organisms. Nurse logs are often hollow, and used for a variety of purposes by wildlife. When creating snags from dying trees, it is important that homeowners hire an expert tree service to remove branches and tops of large trees. Homeowners must make sure that whoever does the work is licensed, bonded, and insured, and understands your intention to make a wildlife tree. Contact local arborists for certified specialists who can competently create and maintain wildlife trees. To clearly communicate about wildlife trees between you and your neighbors, hang up these handy wildlife tree signs.These handy wildlife tree signs provide an opportunity to educate friends, neighbors, and the public about why a dead tree has been retained. Charlotte is the co-author of The Midwestern Native Garden, Midwestern Native Shrubs & Trees, and Prairie Directory of North America. Co-authored with Bernard L. Schwartz, The Midwestern Native Garden: Native Alternatives to Nonnative Flowers and Plants was the winner of the 2012 Helen Hull Award from the National Garden Clubs. In 2014, Adelman was awarded an Audubon Chicago Region Habitat Project Conservation Leadership Award. Read more about her work in this feature article in the Chicago Tribune. In planning for and implementing native plants and natural habitat on your property, in your community, it can be helpful and informative to consider the surrounding area, and all of the Chicago Region ecosystem. CLC is all about creating corridors on private property that help to connect natural area cores. A private property can participate in a row or stepping-stone corridor that helps with the movement of fauna between core areas. This promotes biodiversity and ecosystem robustness throughout the Chicago Region. A great way to start exploring native habitat cores, corridors and the Chicago Region ecosystem is looking at the Chicago Wilderness (CW) Green Infrastructure Vision (GIV). The final report is here (PDF file). This vision provides an assessment of the existing ecosystem and green infrastructure and provides guidance for improving and expanding natural areas and green infrastructure in the region. Some counties and communities have created a Green Infrastructure plan specific to their area. Chicago Wilderness has helped with this effort through their SWAT Green Infrastructure Mapping Projects. Check the link to see if there is a plan for your county and community. The Green Infrastructure Vision includes lots of geodata and mapping. The Field Museum has an online interactive map here. This mapping includes many layers, including, for example, estimated Ecosystem Services Aggregate Value (in dollars). For those interested in diving deeper into GIV reports and GIV data, see the GIV content and data stored at CMAP. The geodata is publicly available for download. The I-View data can be downloaded. Here are different ways you can help create a healthy, diverse Chicago Region Ecosystem. Citizen Science. You don’t need to be a scientist to report ecosystem observations that can contribute to research and a better understanding of the Chicago Region Ecosystem. This section of CLC Resources provides information on the relationship of your private property native garden/habitat with the surrounding area ecosystem and the entire Chicago Region ecosystem. Learn about stepping-stone corridors for fauna, green infrastructure, citizen science activities, volunteer stewardship opportunities, and the value of demonstration gardens. Chicago Region Ecosystem – Introduction. Included here is information about the Chicago Wilderness Green Infrastructure Vision, county and community green infrastructure plans, and additional Chicago Region ecosystem mapping and data resources. Getting Involved After creating native habitat on your property, consider also activities that help the entire Chicago Region ecosystem. Included here are Citizen Science Activities, and public & private land restoration & maintenance — stewardship and volunteers welcome! Demonstration native habitats. Public properties with native habitats (Field Museum, Peggy Notebaert Museum, local park, local library, etc.) help to promote creating native plant gardens and habitats on private property. Coordinating organizations. There are a number of organizations promoting citizen participation in maintaining and improving the Chicago Region ecosystem. The list includes: Rights -of-Way As Habitat, Chicago Wilderness, Field Museum, Peggy Notebaert, Morton Arboretum, and Chicago Botanic Gardens. National groups that provide guidance include: National Wildlife Federation, Audubon, and Xerces Society.